2019 Hugo Nominee for Best Graphic Story: A webcomic where a ragtag crew travels to the deepest reaches of space, rebuilding beautiful, broken structures to piece the past together. Two girls meet in boarding school and fall deeply in love―only to learn the pain of loss. On a Sunbeam is a webcomic and can be found here. I'm not sure how it might differ from the paper version (if anything was redrawn, what chapters are covered, ect). This is a Hugo Nominees 2019 Club post. You can find the current schedule for upcoming posts here. The graphic novel is beautiful. Nice and thick too. Covers the whole story I believe. Absolutely loved it! Ooooh this crossed my desk a few months ago and while blurbs aren't generally something I put my complete trust and faith in, I was immediately smitten with the one that described it as a "slow-burn romance and a found-family space opera adventure" because those are all my catnip tropes. I haven't read it yet, though, because the paperback is huge and thick and mildly intimidating when I can read most standard graphic novels in an hour or so over lunch. I feel like this is the kind I need to actually sit down and read which requires a different sort of focus that I just haven't bothered to find time for. It's a great book. Walden has a style that's difficult to explain; it's sort of like she's usually somewhat sparing in detail, so when she does open out to a bigger picture or vista or even a single or double page spread, it's stunning. Visually, it's very unlike most SF comics; there are spaceships, but they look like goldfish, and the architecture of buildings is more traditional than SF-cliche-y. I read Spinning recently (Walden’s autobiographical graphic novel about being a competitive figure skater) and liked it. 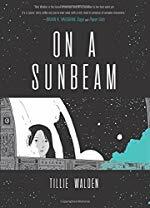 I had a very difficult time getting into On a Sunbeam ...the art felt very crushed and scratchy, and a few of the characters looked too similar to try and keep straight. I got through maybe the first 30 pages before giving up. I really wanted to like it, so I would be interested to hear other opinions. Should I try again? Should I read the webcomic instead? I had a very difficult time getting into On a Sunbeam ...the art felt very crushed and scratchy, and a few of the characters looked too similar to try and keep straight. I got through maybe the first 30 pages before giving up. I really wanted to like it, so I would be interested to hear other opinions. Should I try again? Should I read the webcomic instead? I think it picked up after the first few chapters. I had some problems telling people apart at the beginning, too - especially Jules and Alma, and the color differentiation between past and present didn't work that well for me because the entire palette was so muted. I'm not sure how much of a difference reading the webcomic version would make - I was honestly wishing I was reading the paper version because it'd be easier to flip back and reread sections that way. Also yes, First Second books puts out a high quality product. I did end up loving it by the end. The background surrealism was amazing, especially as they visited different locales. And there were some great facial expressions in there, too! The story in the end was very affecting, and I liked how everyone had something to do - while there were secondary characters, they all felt like they could have been main characters without much of a POV shift. It's also very delightfully woman and nonbinary centric in an unforced way. There's just a lot of women and a nonbinary character in the story, there's no need for explanation, they just are. Absolutely French-ish art style. Moebius, but not problematic. Get the paperback. I loved it. Hands down loved it. Then I left town, and when I got back my house-sitter said he loved it, and got his own copy. I hope it wins the Hugo, it’s one of my favorite graphic novels in years. Worthy companion to Always Human in a way I think..